Go ahead...stop at that fast food place...and still lose weight! I’m a realist and know that it might not be possible for people to pack healthy food and eat their pre-prepared food at every meal. Life happens, and when we get busy and get starving, fast food temptations are at every corner ready to derail our healthy eating habits. But it doesn’t have to be a total loss at your nearest fast food place. Just make the healthiest choice possible when faced with a fast food emergency. Below are some popular fast food spots that offer some of the worst food as far as calories, fat and sodium are concerned, but then also have a few surprisingly healthy choices. Choose wisely and you can survive the drive-thru! Any of these 6” sandwiches: Ham, Oven Roasted Chicken Breast, Roast Beef, Subway Club, Turkey Breast, Turkey Breast and Ham, Veggie Delite. You can add all the veggies you want to these sandwiches, but adding cheese, oil, mayo, ranch, etc will cause the calorie and fat content to go up. Most restaurants have their nutrition information listed on their website, so if you don’t see your favorite fast food joint up there in my list, get the nutrition info before you have to make a pit stop so that you are armed with the information to make a healthy decision. Think you’re too young to worry about loss of strength and flexibility? You are WRONG! It is never too early to start preparing your body for the aging process. The human body peaks around the age of 25 in both strength and flexibility. From there, without proper care and training, your body’s functionality starts to go downhill (i.e. it starts getting hard to move and do every day activities). This is what happens, your muscles start to atrophy (weaken) and your flexibility decreases. The combination of these two events cause everyday movements such as bending over and getting up harder and harder as we age. This isn’t to scare you, especially if you are in your 30s, 40s, 50s or older. You can improve your body’s function and even reverse the signs of aging! How to: Sit in a chair or on your couch and without using your arms to push or pull yourself up, simply stand up. Repeat 20 times in a row. You’ll be strengthening your abdominals and lower body as well as stretching out your lower back. Pick ups. That’s right, picking things up off the floor around your house can keep you young. So be intentional about picking up one item at a time so that you have to keep bending over to pick up every item individually. If you, like me, keep an immaculate house, clutter free (HA! ), then throw some stuff on the floor and get to work OR better yet, go and pick up trash in your neighborhood or favorite park! How to: Bend over from the waist, keeping your knees slightly bent, pick up an item and stand back up to straight while rolling your shoulders back and down. You will be stretching out the hamstrings, lower back and strengthening your abs, lower back (as you stand up), lower body PLUS improving your posture with a roll of your shoulders. I just had a great workout, and guess what...I'm on vacation. Just because I get to sleep in for a few days and relax by the pool, doesn't mean I want to lose what I work so hard for the rest of the year. So here is the workout I just did. It's cardio, it's strength, it's challenging and it's done in 40 minutes flat. 20 minute run: I ran the biggest, longest, steepest hill of my entire life and it felt GREAT. So wherever you are, in a hotel, at the lake, on the beach or in the mountains, find a trail, road or treadmill and get your booty moving. 16 minutes of strength and plyometrics, Tabata style: do 8 sets of 20 seconds of work/10 seconds of rest (total of 4 minutes) for each of the following exercises. Complete all 8 sets of one exercise before moving on to the next. ...and then move on to the rest of your vacation plans. Enjoy! This time around, I thought I’d share some of my favorite workout gear instead of food. These are three things that I use several times a week if not daily to keep focused, comfortable and to push my body to be better and healthier. SPIbelt: Although I am normally not a fan of fanny-packs nifty little belt is a less obvious way of carrying I.D., keys and your phone on a run. I bought one after I experienced some wrist problems stemming from holding my phone (also my music player) on long runs. I highly recommend it, even to the fanny-pack hater (it is easily hidden under your shirt or waistband. 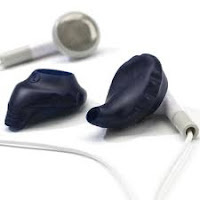 yurbuds: Anyone else absolutely hate it when you sweat so much your earphones fall out during a workout? It’s the worst (especially in this crazy-hot weather)! I recently tried out yurbuds. They essentially “lock” into your ears and do not, I repeat DO NOT, fall out…it’s like magic! They are a bit more pricey than your average headphones but sooooooo worth it. Okay, so maybe most of us can’t actually physically workout right next to Gabby Douglas, Michael Phelps or Kerri Walsh Jennings, but while we watch the best athletes in the world do their “thing,” we sure don’t need to be sitting on the couch for hours on end becoming less-athletic. So, here is what I propose: take the excitement and adrenaline you feel watching high-powered athletes compete and channel it into an extra mini-workout or two a day. Obviously, it works really well to get on a stationary bike, an elliptical or a treadmill to get your sweat-on while watching the games, but if you don’t have the equipment at home or a gym membership, check out these event-specific, calorie scorchers below. · Swimming--Do core work for swimmer’s abs: planks, back extensions, bicycle crunches. · Gymnastics--Get chiseled legs and arms: squats, lunges, pushups and tricep dips. · Volleyball--Practice your vertical jump: jump squats. · Soccer and Basketball--Work on your endurance: jump rope. · Boxing--No brainer here: shadow box!